Abstract. Mineral dust plays an important role in the climate system by interacting with radiation, clouds, and biogeochemical cycles. In addition, natural archives show that the dust cycle experienced variability in the past in response to global and local climate change. The compilation of the DIRTMAP (Dust Indicators and Records from Terrestrial and MArine Palaeoenvironments) paleodust data sets in the last 2 decades provided a benchmark for paleoclimate models that include the dust cycle, following a time slice approach. We propose an innovative framework to organize a paleodust data set that builds on the positive experience of DIRTMAP and takes into account new scientific challenges by providing a concise and accessible data set of temporally resolved records of dust mass accumulation rates and particle grain size distributions. We consider data from ice cores, marine sediments, loess–paleosol sequences, lake sediments, and peat bogs for this compilation, with a temporal focus on the Holocene period. This global compilation allows the investigation of the potential, uncertainties, and confidence level of dust mass accumulation rate reconstructions and highlights the importance of dust particle size information for accurate and quantitative reconstructions of the dust cycle. After applying criteria that help to establish that the data considered represent changes in dust deposition, 45 paleodust records have been identified, with the highest density of dust deposition data occurring in the North Atlantic region. Although the temporal evolution of dust in the North Atlantic appears consistent across several cores and suggests that minimum dust fluxes are likely observed during the early to mid-Holocene period (6000–8000 years ago), the magnitude of dust fluxes in these observations is not fully consistent, suggesting that more work needs to be done to synthesize data sets for the Holocene. 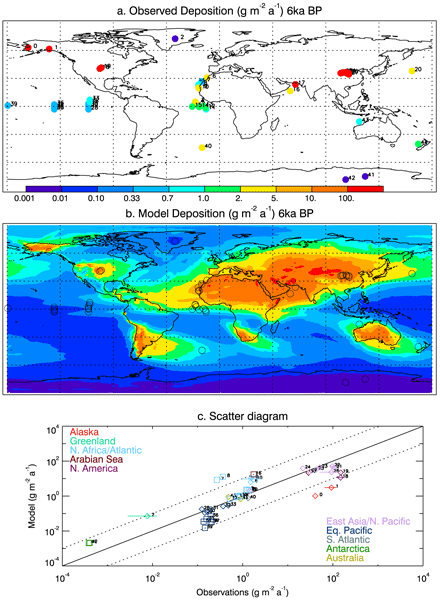 Based on the data compilation, we used the Community Earth System Model to estimate the mass balance of and variability in the global dust cycle during the Holocene, with dust loads ranging from 17.2 to 20.8 Tg between 2000 and 10 000 years ago and with a minimum in the early to mid-Holocene (6000–8000 years ago). How to cite: Albani, S., Mahowald, N. M., Winckler, G., Anderson, R. F., Bradtmiller, L. I., Delmonte, B., François, R., Goman, M., Heavens, N. G., Hesse, P. P., Hovan, S. A., Kang, S. G., Kohfeld, K. E., Lu, H., Maggi, V., Mason, J. 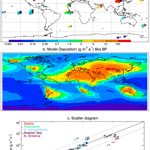 A., Mayewski, P. A., McGee, D., Miao, X., Otto-Bliesner, B. L., Perry, A. T., Pourmand, A., Roberts, H. M., Rosenbloom, N., Stevens, T., and Sun, J.: Twelve thousand years of dust: the Holocene global dust cycle constrained by natural archives, Clim. Past, 11, 869-903, https://doi.org/10.5194/cp-11-869-2015, 2015.